A type of flour produced from grinding polished rice (the bran and germ have been removed) into a powder. White rice flour can be used as a thickening agent for sauces and puddings. It is also very popular for the preparation of a variety of Asian noodles. It is used in some baked goods, such as cakes, cookies, and dumplings, but because the flour contains no gluten, it is not suitable for baking yeast breads. It must be combined with wheat flour in order to attain the properties of gluten formation necessary for yeast dough to properly rise. White rice flour contains high levels of protein, but it contains much less vitamins, minerals, and fiber than brown rice because of the removal of the bran and germ. Since white rice flour contains no gluten, it is a suitable substitution for wheat flour for people who cannot tolerate gluten in their diets because of a severe allergic reaction (celiac disease). When properly stored in a tightly covered container in a cool dry location, white rice flour may last indefinitely. 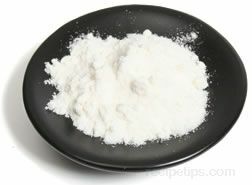 White rice flour is often found in large food stores.